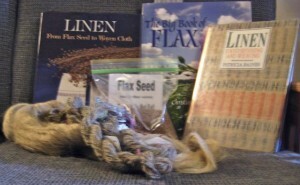 Books, seeds, flax strick, and yarn. Last summer I finally learned to spin flax in a workshop with Patsy Zawistoski at Michigan Fiber Festival. This summer my husband Phil suggested taking my linen yarn making back to the beginning, by growing and processing our own flax. 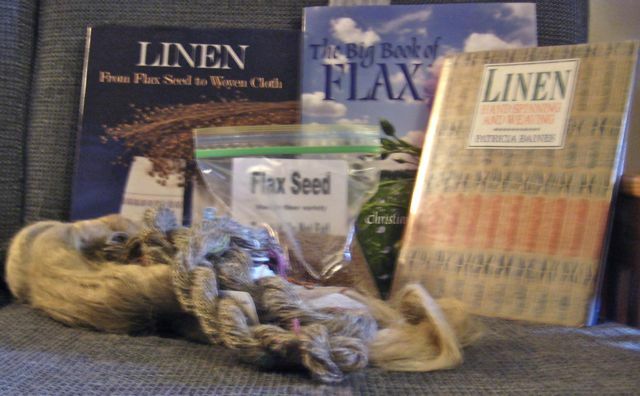 Over the winter I practiced spinning flax, ordered and read all the books I could track down, and found a source for seeds of Marilyn flax, a variety recommended for yarn production. There will be some special challenges because we are apartment dwellers, but we rent a plot for vegetable gardening each summer at the Champaign Park District’s Eddie Albert Garden Plots. We never get the whole 20’x20′ plot planted, so this year we will use about a third of it for flax. Yesterday was the first day this spring that the soil was dry enough to work, as well as the last day before a predicted five days of rain, so we had a long day at the garden. After about five hours of spading, breaking clots by hand, and raking, a 9×12 area for flax and a 4×4 area for lettuce were ready. After that it didn’t take long to broadcast the flax seeds and plant lettuce and spinach, with just enough energy left to head for our neighborhood Mexican restaurant for dinner and margaritas. Once the rainy spell is over, I hope to have a picture to post of a field of sprouted flax. Please check back often to follow my progress! Looking forward to seeing your field of magically sprouted seeds, and to the small inland sea of blooming blue they will become! Thanks for sharing. 100% Hackled Flax Fiber , mainly handmade . Weights are according to Customer request . (50 : 1000 ) gr. Available in 1st grade and 2nd grade . Available in Normal Packing 50 kg bales (Jute or PE bales according to customer request) and Individually packed in cartons . Hackled Flax fiber in sliver on spool shape 40 or 80 gr. With carton tube . Hackled Flax fiber in sliver on spool shape In plastic can . 40gr. / 80 gr. Hackled flax fiber in sliver on spools WITHOUT carton tube .40 gr. / 80 gr. Hackled flax fiber in sliver on balls 100gr. Weight can be customized according to customer request. Used mainly in Spinning Preparations and Yarn Manufacturing . Also used in Spinning Preparations and Yarn Manufacturing. Available in the Natural color and also Bleached . Average RKM is 14 , Can be Justified according to Customer Request .